So what is personal style? How does it differ from Personal Brand ? . . . and why, oh why, does any of this actually matter? This Blog Post is an introduction to Personal Brand Management (PBM) and also gives my own top 10 tips on finding and perfecting your own Personal Style. I hope you find it useful and if you have any queries please PM me on @orladiffily on Instagram or Twitter. Your personal style is very much owned, controlled and projected by YOU and grows with you as you age and adapts to your lifestyle. Once you recognise your own signature style, it is essentially part of your personality - and your projection of your best self. You also will feel comfortable in what you wear - because it is 'YOU". Your Personal Brand is your reputation and includes your personal style, but also so many more elements you have less control over. Personal branding is the practice of people marketing themselves and their careers as brands. ... Personal branding is essentially the ongoing process of establishing a prescribed image or impression in the mind of others about an individual, group, or organisation. In essence, building your personal brand, is essentially PR-ing yourself. Once upon a time, your personal brand, was perhaps a business card with a logo on it. Now, with conscious dedication and time, you can carefully cultivate your Personal Brand to positively influence those who engage with you or your business. As with all brands, you need to decide who you are, what you stand for and who exactly you want to talk too? Then you carefully curate your brand - and communicate your values via social media, traditional media, personal style and lots of other everyday activities (in fact almost everything you do in the public domain). Importantly, Personal Brand Management is not just for self employed people, or public figures (politicians, personalities, influencers), everyone needs to be at least aware of their Personal Brand - especially if you looking for a job or want to advance your career. It’s all rather complex - but as with everything, you have to start somewhere - so let’s make it with something you can easily work with (and have fun with) - your own Personal Style. . . Your personal style - is how you dress (including your hair and make up) to communicate who you feel you are - and who you know you can be. Due to the wardrobe restrictions of work life, uniforms, climate, lifestyle and to some extent our budget - sometimes you can only express your own personal style on a night out or at the weekend - but it is important to recognise it as it is an expression of who you are and will also save you a small fortune in buying items that are not “YOU”. From the outset it is important to understand that personal style is subjective and unique to each person. What I love - you may hate. That what makes it so special, and so personal. The good news is . . . personal style normally gets better with age. As we grow up, we are less inhibited by what our friends are wearing, or fashion trends in general, and opt for what suits us. We also grow into our bodies and our look. We feel more comfortable and learn to know what works for us - saving time, money and a lot of stress. I work with people everyday - who want to project the right image and to also feel ‘at home’ in their wardrobe choices. So I hope the following top 10 tips for perfecting your own personal “Signature” style will be useful. As always, PM me on Instagram if you have any questions. I would love to hear from you. Write down on a piece of paper your personal style icons - both from your real everyday life and then your favourite celebrities. Ask yourself, what do you admire about their style and look at the elements that create that look. Remember style is more than a dress or co-ordinated separates - it is how you finish the look (hair, make up, jewellery, the small details) and then HOW YOU WEAR IT! 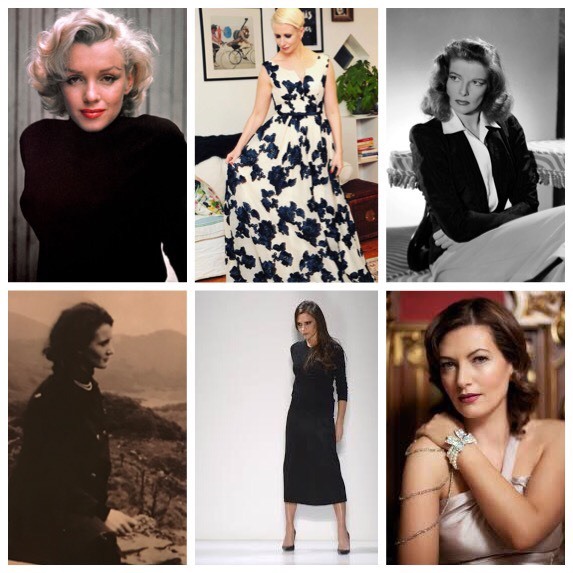 Katharine Hepburn, Victoria Beckham, Marilyn Monroe, Maura Derrane, Aisling O Loughlin and my mom! (Others would include Helen Mirren, Christina Hendricks, Lauren Bacall). You get the idea. In my opinion they all have a very distinctive look. They own it! (Well known celebrities such as Lady Gaga, Rihanna have style - but it looks very styled as they are dressed by others and so it constantly evolves - so is not really a signature). Steal their style . . .
For example, for the KFW Awards Gala, I didn’t want to wear a Ball Gown (especially as I had worn a show stopping Theia dress the previous year - and simply felt I couldn’t top it!). So I looked to celebrity for inspiration! I loved Alexa Chung on the BFW red carpet from a few years before - and re -created the look to suit my age and shape with the help of the brilliant womenswear designer Tina Griffin. Did it work ? I have to say I loved it and have worn this dress many times since - so it was worth the investment. 2. Understand what exactly is YOUR body shape? We are all born with a particular body shape - and our actual body weight is different. There are lots of useful guides now online - so it is easy to determine if you are an hour glass, apple, pear, etc. For example body con dresses tend to suit hour glass figures, and tunics flatter an apple shaped figure. This is a specialised topic and certainly the topic for a future post. 3. Build a wardrobe you will wear and wear and wear. Go through your wardrobe, try everything on - and give away what you honestly know you never should have purchased and will never, ever wear (trendily known as auditing your wardrobe). Then put similar colours together (you don't have OCD - you are just organised!) so you can easily mix and match your look. I put all my basics (black pants, white shirts, block coloured dresses etc) on one rail and then all my key pieces or the latest trends on another rail. So in the mornings, or if I am planning my look for an event, I can easily see what to wear without having to root through closets. Although true personal style transcends age - you still have to go with your body and time. Key words here are sleeves, pencil skirts (not minis) and maximise your shape (whilst minimising what you actually show - so either a low top or a short skirt - but not both!). 5. Invest in well made basics and key pieces. Beautifully made clothes cost money - but they last and will fall better and flatter your figure. It’s perfectly OK to create a wardrobe ‘uniform’ - pieces you know instantly work with your shape and colouring and lifestyle. Ultimately perfecting your personal style is about saving time and stress by knowing you will look good. As we are all grown up now, we get to choose our own uniform ! 6. Allow yourself to be inspired . . . and then adapt it to your own budget and lifestyle. Victoria Beckham recently showed her new collection in New York. I watched the show on Instagram and was actually more inspired by what she wore backstage! Sadly I can’t afford to buy her look - but I purchased a pair of wide legged trousers and a polo neck sweater on Zara that night (and it is pretty close!). The ‘originals’ are on my wish list. ! Most well known celebrities are dressed by stylists - (and don’t necessarily have any true personal style - they just look good - because they are well put together). So be your own personal stylist - and put together a visual mood board (or tear looks from Magazines or from Pinterest) of what you love. Put it up on the fridge - or on the mirror in your bedroom and then bring it shopping with you. Firstly I bet you will find there is a theme in what you love (shapes, colours, style) - and having a visual idea of what you want to wear helps rather that blindly shopping. 7. Accept that it takes time and don't feel guilty about it. 8. Get good advice. Most good department stores and boutiques offer styling advice, however if you are really looking to find a personal style for life, it is worthwhile consulting a stylist to help you see what works with your life, body shape, age and own comfort levels. This costs money - but ultimately it will be worth it. 9. There is also no such thing as effortless style. It takes practice and a good wardrobe of basics to look comfortable and stylishly effortless. Also, remember having your own personal style doesn't mean you can't adopt trends. It just means you adopt then adapt them so you wear them your way. 10. Don’t delay. I meet people everyday who are worried about what to wear to an up-coming event - or how to look their personal best everyday for work and life. Some want to stand out - others simply don't want to let the side down. Most simply want to develop a dress code, a signature look, for life. So go for it! I hope the above tips help!. As always, please PM me @orladiffily on Instagram or Twitter if you have any queries.